New Taikang Decoration City is located in Guangzhou City, the oldest decorative materials business business area, Taikang Road and Beijing Road Pedestrian Street at the junction of international, world-renowned west of Haizhu Square, an area of ​​nearly ten thousand square meters, is a hardware, sanitary ware, lighting , chemicals, plates, ceramics, art glass and other decorative materials in one large comprehensive decoration materials market, the market opened in early 2000, after several years of adjustment, the new city has become the city's Taikang decoration the most complete, well-known brand most concentrated large decorative materials market. Market environment is comfortable, convenient transportation, the city can take the Metro Line to "Haizhu Square" station off the train, walk 200 meters to the east, but also can take the bus to Taikang Road, Beijing Road, Haizhu Square station or get off the train. 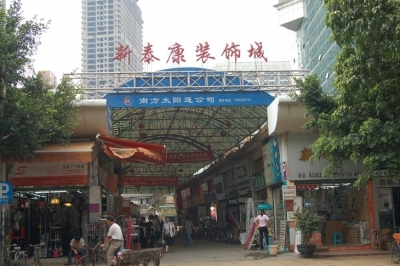 Taikang Road, Guangzhou City, the oldest operating decoration materials of the commercial area, it's booming high-flow and business returns also led it to become the dream of the majority of decorative materials business to the best business center.